Picasso had such a difficult birth and was such a weak baby that when he was born, the midwife thought that he was stillborn so she left him on a table to attend his mother. It was his uncle, a doctor named Don Salvador, that saved him: 'Doctors at that time,' he told Antonina Vallentin, 'used to smoke big cigars, and my uncle was no exception. When he saw me lying there he blew smoke into my face. To this I immediately reacted with a grimace and a bellow of fury'"
No doubt about it, Picasso was brilliant: artistically, he was years ahead of his classmates who were all five to six years older than him. But Picasso chafed at being told what to do and he was often thrown into "detention":"For being a bad student I was banished to the 'calaboose' - a bare cell with whitewashed walls and a bench to sit on. I liked it there, because I took along a sketch pad and drew incessantly ... I could have stayed there forever drawing without stopping"
Born in Germany to an extremely poor family, Beethoven’s father was his first music teacher who was harsh and a known alcoholic. His father decided to train Ludwig as a pianist, so that he could be hailed as a prodigy and win fame and money for the poverty-stricken family. Beethoven was made to practice scales and finger exercises for hours at a very early age. He was performing by age 9. By age 13 he played the piano in an orchestra and conducted the band at rehearsals for no salary. Beethoven well noted for composing nine symphonies, continued to compose music even after he began losing his hearing at age 28, most likely from lead poisoning. After going death he cut the legs off a piano so he could feel the vibrations of the music so that he could still compose music. Beethoven's character often showed disdain for authority, and for social rank. He would stop performing at the piano if the audience chatted among themselves, or afforded him less than their full attention. At the end of the premiere of his Ninth Symphony, he had to be turned around to see the tumultuous applause of the audience; hearing nothing, he began to weep. Beethoven was most heavily influence by Mozart. His most important teacher was German composer Neefe who used the music of Bach for instruction. In 1792 Beethoven studied with Haydn. Beethoven never married. Ludwig van Beethoven passed March 26, 1827. Twenty thousand people followed him to his grave. Among them was Schubert. Beethoven is regarded by many as one the greatest composer of all time. As a child, Einstein seldom spoke. When he did, he spoke very slowly - indeed, he tried out entire sentences in his head (or muttered them under his breath) until he got them right before he spoke aloud. According to accounts, Einstein did this until he was nine years old. 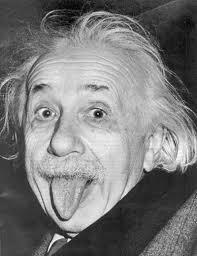 Einstein’s parents were fearful that he was retarded - of course, their fear was completely unfounded! Einstein Became Estranged From His First Wife, then Proposed a Strange "Contract"
There’s more, including "you will stop talking to me if I request it." She accepted the conditions. He later wrote to her again to make sure she grasped that this was going to be all-business in the future, and that the "personal aspects must be reduced to a tiny remnant." And he vowed, "In return, I assure you of proper comportment on my part, such as I would exercise to any woman as a stranger." The Saga of Einstein’s Brain: Pickled in a Jar for 43 Years and Driven Cross Country in a Trunk of a Buick! After his death in 1955, Einstein’s brain [wiki] was removed - without permission from his family - by Thomas Stoltz Harvey [wiki], the Princeton Hospital pathologist who conducted the autopsy. Harvey took the brain home and kept it in a jar. He was later fired from his job for refusing to relinquish the organ. It goes to show you , no matter what's your short coming's is in life you can still make a difference. I find the "Contract" between Einstein and his wife interesting. I wonder why she put up with it? Thanks.